The Genealogical Society of Henry & Clayton Counties, Inc.
We can help you! Limited research is available at $20 per surname search. This will not be an in-depth search but will be limited to materials available in our library. Your Queries (50 words or less) will be published in our quarterly newsletter for $2 for nonmembers. Include your name, address and phone number on your request whether by mail or e-mail. THE GENEALOGICAL SOCIETY IS TRYING SOMETHING NEW. WE HAVE ALREADY HAD TWO BEGINNING GENEALOGY CLASSES TAUGHT BY MRS. SARAH JANE OVERSTREET AND THEY HAVE BEEN A HUGE SUCCESS. STARTING JULY 20TH WE WILL BEGIN A SATURDAY CLASS. THERE WILL BE TWO OTHER SESSIONS FOR THIS CLASS TO BE HELD ON SEPT 21 AND NOV 16TH. THESE CLASSES WILL BEGIN AT 11:00 A.M. BUT THE BROWN HOUSE WILL OPEN AT 10:00. FOR THOSE NOT WISHING TO TAKE THE CLASS THE BROWN HOUSE WILL ALSO BE OPEN AT THIS TIME FOR RESEARCH. IN ADDITION SEAN MCLENDON HAS AGREED TO COME ON THOSE SATURDAYS TO ANSWER YOUR QUESTIONS ABOUT USING ANCESTRY.COM. WE WILL OPEN AT 10:00A.M. AND CLOSE NO LATER THAN 2:00 P.M. THIS IS A GREAT OPPORTUNITY FOR THOSE WHO WORK THROUGH THE WEEK WHEN WE ARE USUALLY OPEN AND FOR THOSE WHO ARE NOT FAMILIAR WITH THE ANCESTRY.COM WEBSITE. October 12, 2013, 10:00 A.M. The Genealogical Society is located at 71 Macon Street in McDonough, Georgia, a growing town and area about 35 miles southeast of Atlanta off I-75 South. It is housed in the 1820's home of Andrew McBride, a Revolutionary War soldier. 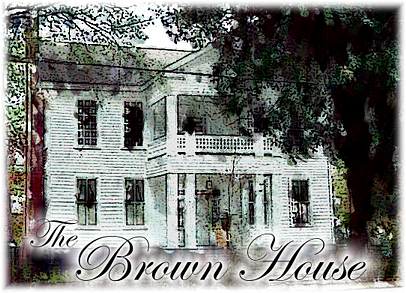 The house, now known as the Brown House, is on the National Register of Historic Buildings and is among the oldest surviving buildings in Henry County. $65. Now $50. plus $6.00 S. & H.
reg. $65. Now $50 plus $6.00 S. & H.
Georgia Residents. We have a very limited supply of these book (they are not used books) which includes information on the 5 counties that were taken out of the original Henry County. This book will never be republished as the Rainer family owns exclusive rights to this publication. What we have on hand is the last published version which includes an index. The Society has available hundreds of reference books, microfilm of census records and old newspapers along with other items for researching your genealogy and ancestry. In addition, the Society has many publications available for your use or for sale if you cannot visit. To become a member and receive our useful publication Ancestor Update (now a quarterly newsletter) related to Henry County's past, send us your name, address, email address & phone number along with an annual membership fee of $30 for a single and $35 for a joint.